The plenum should have a scalloped cutout underneath to clear the pedal box, as should the trumpet plate it mounts to. This is only about half an inch deep however so if the interference is more than that there may be some other problem. Some photos would help. I've never converted an automatic 2+2 so there may be a problem I'm not aware of. Many thanks Andrew and Steve...........very helpful. I have been advised that I have 2 options.........1) Fit triple SU's instead, (a very nice but very expensive alternative to ditching the twin Stromberg's) or 2) Fit different (and smaller) separate air cleaners, eg. K&N pancake filters, Lynx RF352S Ramflo filters or trumpet/mesh filters..........I am not bowled over by any of these options as the originality of the car would be severely compromised. Any thoughts? I think you must have the rectangular air filter canister and not the drum and plenum type? If so, you can either modify the air cleaner or fit the earlier drum and plenum. (FWIW, I don’t think the factory produced a RHD car with twin carbs so didn’t have this problem). Thanks for your advice on the engine mounts.........they are worn and are in the process of being replaced. I would question the wisdom of using spacers though. I would have thought this could cause other problems. On a different tack.....Has anybody successfully replaced twin Stromberg's with triple Webber's? I believe the fuel pump would possibly need upgrading, (eg. Facet type) and a Filter King fuel regulator would require fitting. The whole set-up though could be achieved at less cost than fitting triple SU's. As Steve says, the spacers are a genuine Jaguar addition. When I got my new frames from Uryk they came with two spacers. The throttle linkage is very tight to the engine frames on the tripple SU set up to the extent that on full throttle the linkage could jam on the frame. Fitting the spacers lifts the engine just enough to prevent this. The spacers are only a few mm thick and given the "hand built" nature of the cars might not be required. They are slotted so very easy to retro fit should you have a clearance issue. Spot on. With the introduction of the 4.2, the linkage runs underneath the carbs. If your mounts are worn or the engine isn't level, the linkage can foul. The worst happens when you drive the car hard and the engine cranks over resulting in a temporary sticking throttle. Happened to me years ago and took a little while to work it out as the throttle didn't stick without the engine running. Thanks for clarifying things on the engine mounting spacers front..........most helpful. Has anyone out there fitted a Series 3 V12 type air cleaner to a Series 2 twin Stromberg engine and so possibly avoided the clearance with the pedal box problems? I see this conversation is a few months old but did you ever find an answer? I am in the same position and think the only fix (other than to fit a new set of triple carbs) is to get get 2 'trumpets' made to enable the filter box to be moved away from the original Stromberg carbs? I think you must have the rectangular air filter canister and not the drum and plenum type? If so, you can either modify the air cleaner or fit the earlier drum and plenum. 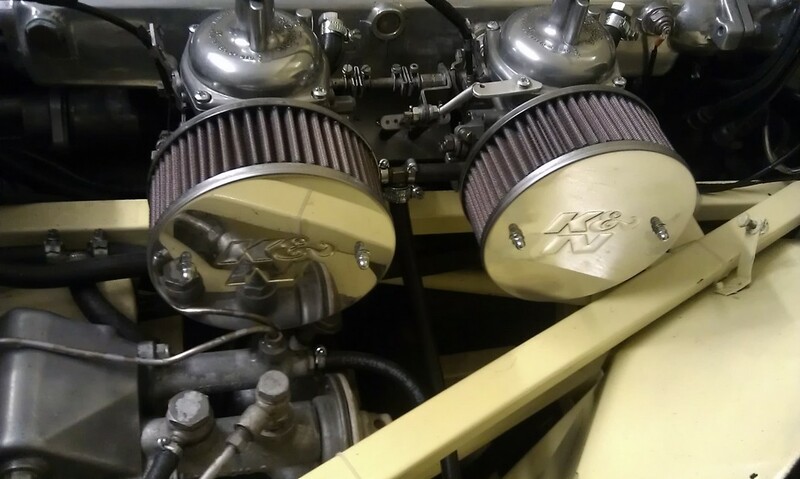 with a bit more background, all cars up until around 1970 had the silver drum containing the air filter and a plenum with a back plate that either fitted the triple SU set-up or the twin Stromberg one and it cleared the pedal box etc. so was suitable for LHD or RHD installations. Around 1970 onwards, LHD cars in the US which all had twin Strombergs by then had a different rectangular air filter fitted which had a thermostatic warm air supply for emission reasons and is like the air filter arrangement fitted to Series 3 cars. This air filter arrangement fowls the pedal box etc. 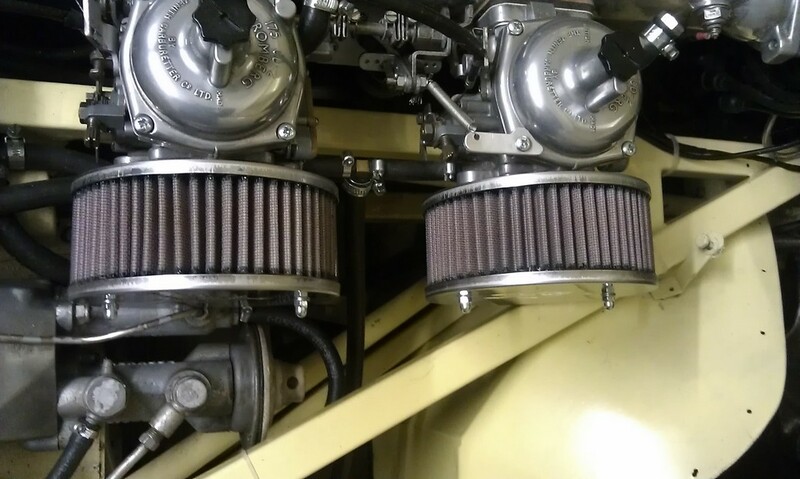 if fitted to RHD cars, so the solution as Angus suggests is to fit the silver drum air filter and earlier matching plenum for a twin Stromberg set-up. The air filter drum and mounting bracket can be bought new as reproductions - although not cheap - and the twin Stromberg plenum should be relatively easy to find secondhand from folks who've converted from twin Strombergs to triple SUs. Don't forget to modify your inlet manifold to hold the inner throttle plates permanently open on your twin Stromberg set-up, details elsewhere on here. That way you'll get almost as good performance from the Strombergs as you would from triple SUs. I have played around with alternative air intakes for my S2 two-Stromberg CD175 engine. They look OK, but the bottom of the left hand one fouls on the clutch fluid pipe. When the engine starts, it's going to knock on this pipe and something is going to break. The engine has not been started with these fitted. I am now looking at Ramflo 452s or 352s since they will fit. They have a claimed flow rate of 400 and 300 cubic feet per minute. I'm not sure what the flow rate of the K&N filter was. I cannot find the 452s anywhere in the UK. The 600 series ones will not fit. The interference appears to be with your clutch master cylinder and specifically the output pipe. Are you sure this cylinder is correct as mine is different with angled output pipe work.